I have been toying with the idea of placing some offset iron sights on my AR, but can't seem to make up my mind on how I want to go about it. I first used and later sold a JP Short-Range Tactical Sight. I experienced no problems with this set-up; it was light, compact, and effective. Then I saw the Surefire Rapid Transition Sights. While I have no experience with these sights I don't think I want fixed sights protruding from my rifle; when I could just as easily have folding sights that stay out of the way until I need them. 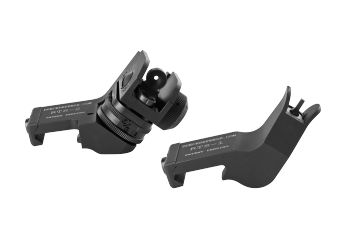 Knight Armament's Offset Micro Folding Sights. These not only look great but utilize KAC's bullet proof sight design. It might take me a little longer to save enough green for them, but aren't goals good to have? 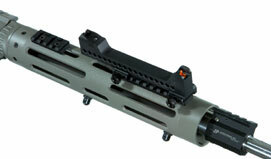 US Military Upgrading Flash Hiders - Addition of Silencers Next?